Place chicken carcass into slow cooker stoneware & nestle the vegetables in with the bones Add garlic, bay leaves, Italian seasoning & water Cover & cook on low for 8-10 hours (I cook it all day & then let it cool overnight) Remove stoneware & cool completely Using a sieve, strain all the broth from the vegetables, bones & herbs & portion out into Ziploc bags Freeze flat & then stack in freezer NOTE: My camera just died, so no picture today 😦 I am so sad, but it is cyber Monday, so maybe I can find a really good deal! UPDATE: 12/12/2013 Here’s the picture! 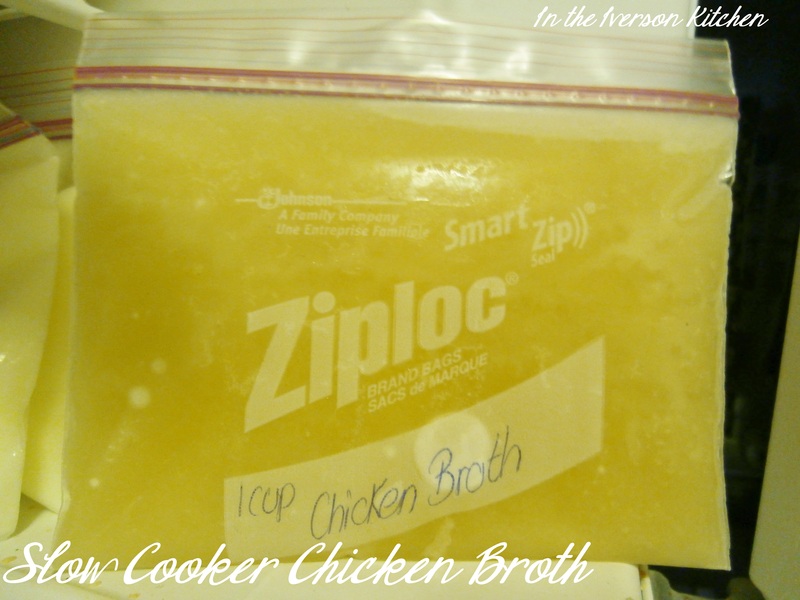 This entry was posted in Chicken, Gluten-Free, Kitchen Tips, Slow Cooker Meals, Soups and tagged chicken broth, freezer, gluten-free, good for you, natural, portions, slow cooker. Bookmark the permalink.